A busy opening day of action, Tuesday 21st August, in the qualification tournament that precedes the Seamaster 2018 ITTF World Tour Czech Open in Olomouc; for the home country in the Men’s Singles event there had not been the best of fortunes. Some eight host nation players had experienced defeat against foreign opposition but, as the day came to a close, David Reitspies and Lubomir Jancarik responded. Alongside Tomas Tregler, they were the Czech players who remained alive and kicking. Tomas Tregler kept his aspirations alive by beating colleague, Jakub Kleprlik (11-3, 11-5, 11-4, 8-11, 11-9, 11-8); the winner earlier in the day against England’s Andrew Baggaley (11-9, 11-9, 12-10, 3-11, 11-7). Meanwhile, listed at no.289 on the current Men’s World Rankings, David Reitspies accounted for Austria’s Andreas Levenko, named at no.125 (11-5, 11-9, 11-5, 12-14, 11-8). An impressive effort by David Reitspies but the performance that attracted the attention was the success recorded by Lubomir Jancarik when facing Sweden’s Truls Moregard. 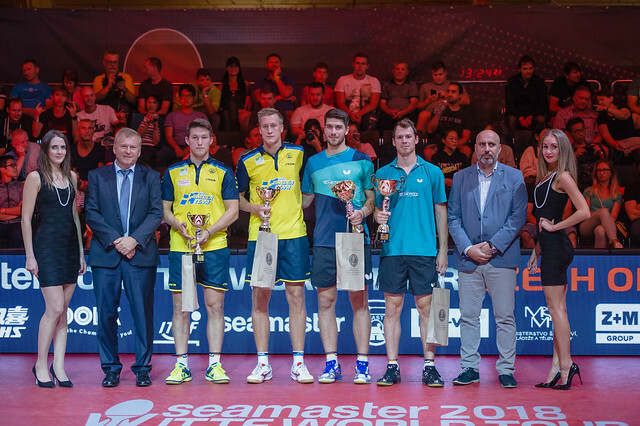 It was a contest which suggested that the Czech Republic player should win; he is listed at no.112 on the current Men’s World Ranking, the 16 year old Swede at no.275. However, Truls Moregard, runner up in the Boys’ Singles event at both the 2017 World Junior Championships and the more recent 2018 European Youth Championships, is a young man hungry for success; he very nearly caused an upset. Lubomir Jancarik won but he needed the full seven games, only emerging successful by the very minimal margin in the decider (11-8, 14-12, 9-11, 11-9, 10-12, 8-11, 13-11). In the third preliminary round, play in the Men’s Singles qualification tournament being organised on a knock-out basis, Lubomir Jancarik faces another Swede, he confronts Jon Persson; Tomas Tregler opposes Austria’s Stefan Fegerl, David Reispies faces Frenchman Can Akkuzu. The Men’s Singles qualification tournament comprises four rounds and concludes on Wednesday 22nd August.